The 2018 Portland Museum of Art Biennial features more than 60 works by 25 artists from across the state or with a deep connection to Maine. The works, on show through June 3, include textiles, sculptures, video installations, photography, and painting. They reflect the state’s increasingly diverse community and perspectives, and the role art plays during this historically impactful time. The show is curated by Nat May, former executive director of Portland’s alternative arts venue SPACE Gallery. Admission: $15 adults, $13 seniors, $10 students with a valid ID, free 14 and under; free Fridays 4-8 p.m. for everyone. 207-775-6148, www.portlandmuseum.org. Head to the Hotel Viking and get a chance to hang with Matt Light, former New England Patriots lineman and three-time Super Bowl champion, and chef Mike Robinson, a prominent game chef and owner of the Michelin-starred pub Harwood Arms in London. During three Field and Forage events on Feb. 22 and 23, enjoy cocktails and game-inspired light bites, or a family-style game dinner with Robinson and Light, and watch Robinson butcher a wild Texas deer. Also bid on four tickets to Matt Light’s Celebrity Shootout, a New England Patriots game jersey signed by Tom Brady, and a package that includes two airline vouchers to England and a personally guided hunt with Robinson. Rates: $65-$175 per person. 800-556-7126, www.vikingspecialevents.com. 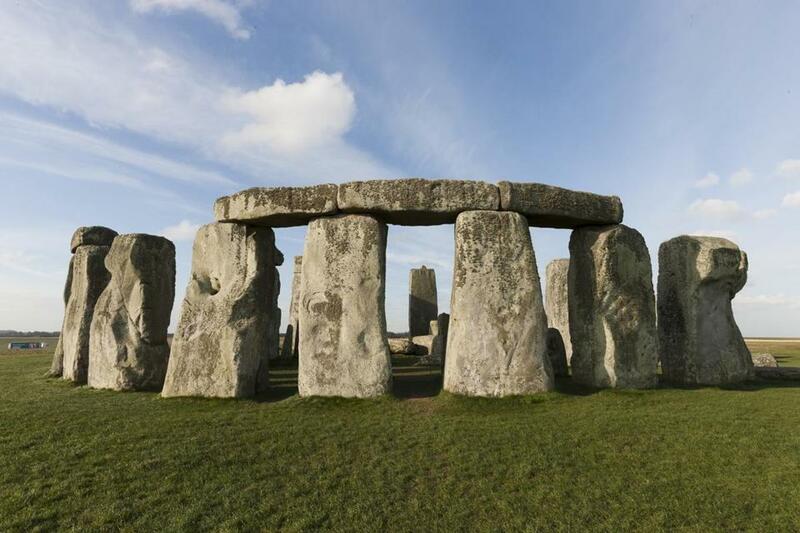 Up until 100 years ago, Stonehenge — the legendary monument made of enormous standing stones — sat on private land in England owned by Sir Cecil Chubb. In October 1918, Chubb gifted the monument to Britain, enabling it to become one of the country’s top visitor destinations. To celebrate the anniversary, The Carter Company has launched a new luxury cycling tour that includes a guided tour of Stonehenge. Visit the impressive monument, wander through Neolithic homes to see how people lived 4,500 years ago, and enjoy an exhibition that explores how and why the monument was built. The six-day trip also includes rides through southeast England’s New Forest, one of the country’s 10 national parks, which has thatched villages and free-roaming horses. Rate: $1,749 per person, based on double occupancy, includes lodging, daily breakfast, luggage transfers, and bike support. Tours start every Sunday from Burley, 90 minutes by train from London. www.the-carter-company.com. Want $2,000 to travel the world? Apply for the Explore the World scholarship program, run by Hostelling International (HI) USA, which will award 104 people with money to help fund their academic, volunteer, or vocational programs. Grants go to people between 18 and 30 years old who want to take an educational or service journey, but don’t have the financial means. HI USA aims to help people from lower socioeconomic backgrounds experience the transformative power of travel. In the past two years, it has awarded grants to 179 people, enabling recipients to teach math in Dominican Republic, learn Arabic in Jordan, and take a first-ever flight to Europe to study abroad. Applicants must be past or former Pell Grant recipients, or else have an income that doesn’t exceed 300 percent of the poverty level. Submit your application by March 2, and plan to travel by Aug. 31, 2019. www.hiusa.org. Maybe your back seat looks like mine, where cereal explosions and spilled drinks meet the apple core graveyard. Keep kids’ snacks and drinks under control with the new Travel Tray, a simple plastic holder that fits securely in any standard cup holder, including those built into your car or your kids’ booster and car seats. The lightweight tray has tall sides for keeping snacks contained and a drink slot that fits cups or bottles. It remains stable when loaded with edible treats or even LEGOs, color pencils, and seashells. Throw the food grade-safe product in the dishwater for easy cleaning. Comes in 11 colors. $14.99-$19.99. 619-633-9808, www.traveltray.us. Stuff one of Mountainsmith’s new ultralight packs in your suitcase or backpack so you’ll have an extra bag for sightseeing, for packing home travel souvenirs, or for hiking a side trail while on a wilderness adventure. The barebones 14-ounce Scream 20 can hold snacks, extra layers, a towel, and a camera. Access its 19-liter main compartment from a handy front zipper or wide roll-top opening. Stash the shoulder straps into a pouch on the back and turn the pack into a compression sack — a clever feature. The slightly larger Scream 25 has more enhanced features, including exterior mesh pockets for water bottles, a waist strap, side compression straps, extra pockets for organizing, and daisy chain loops. It weighs 1.5 pounds and stuffs into its own lid pocket for travel. Both packs have tear- and abrasion-resistant nylon fabric, and a pouch for a hydration bladder. $49.95-$79.95. 800-551-5889, www.mountainsmith.com.